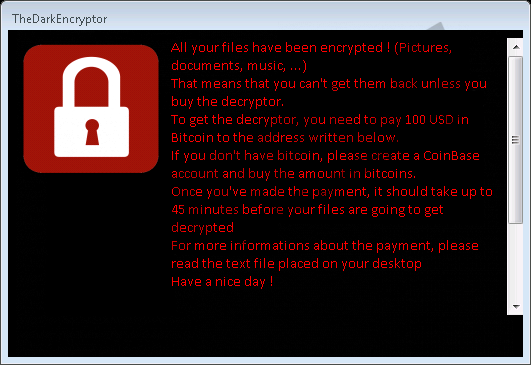 TheDarkEncryptor ransomware is a highly dangerous computer infection which locks computer users out of their files and displays a ransom warning claiming that the data will be restored only after making a payment. Such demands are the essence of ransomware, which is created for the purpose of forcing victims to pay considerable sums of money. It is crucial to remove such infections once they get on the computer and also take preventative measures to keep the system protected and cramp malware development. The more payments are made, the more motivated cyber criminals get. You should resist the temptation to pay the money demanded since there is no guarantee that the schemers behind the DarkEncryptor ransomware are willing to communicate with you after receiving your payment. Sometimes, a computer infections persists on a computer without any interference in a user's actions which is quite the opposite with the DarkEncryptor ransomware. Once the threat is on the PC, it creates its copy in the %Temp% directory where it creates its randomly generated folder. The ransomware encrypts file and changes the screen image to an image containing information the situation. The screen image also contains the Jigsaw character. Additionally, the infection drops an executable file named jshandlr.exe which launches an additional ransom note. The .exe file has its point of execution, which is created in the Registry and can be access by following the path HKCU\Software\Microsoft\Windows\CurrentVersion\Run. All these changes mean that it is impossible not to notice the infection on the computer. You should take immediate action once the DarkEncryptor starts poking at you with its ransom message, not to mention the fact that after encryption, all the files cannot be opened as usual. The ransomware encrypts files, which range from very rarely used or opened by the user to very frequently used, including .doc, .png, .txt, and many others. Encrypted files get the additional extension .tdelf, which is appended next to the already existing one. In order to regain access to the locked files, the victim is asked to pay a ransom of $100 in Bitcoin, which is a cryptocurrency that is used without any central bank or issuer. If the user of the affected computer does not manage to pay the requested money in 5 days, the ransom fee is raised to $350. Bitcoin transactions are made anonymously and are barely traceable, which makes bitcoins a very efficient method for money extortion. The attackers remain an identified, which enables them to continue scheming new cyber attackers. If you ever encounter this currency on the Internet, you should not think that it is made only for criminals. The Bitcoin currency can be used for all manner of online payments, but in the case with the DarkEncryptor, no money transactions to unknown receivers should be made. The DarkEncryptor ransomware seems to be similar to the notorious ransomware dubbed Jigsaw which has demanded a payment of $150. More important the infection would delete a file every 60 minutes. So far, no connection between the two threats has been discovered only that the creators of these infections are keen fans of the iconic character. The DarkEncryptor ransomware spreads via email attachments, which again proves that it is crucial to pay close attention to the content of your email box. Do not hurry to open email attachments sent to you even if they seem to be initiated by known senders. A single click on the download button could initiate malware downloading, so you should be very vigilant about the files you receive to your email. Since there are many other infections that spread in different ways, you should keep in mind that it is not enough to care about your email. You should also be careful when browsing freeware sharing websites. Additionally, you should keep the system and software up-to-date so that malware does not find vulnerabilities that could function as a backdoor to your operating system. Running a reputable security program is one of the most effective way to prevent malware attacks. If you want to have the DarkEncryptor ransomware removed, we advise you to use our recommended anti-malware program, which easily kills malicious processes and deletes damaging files for good. In case you are willing to try removing the infection manually, use the following removal guide, but keep in mind that you make all those changes at your own risk. Open the Task Manager and end the process jshandlr.exe. On Windows XP, go to C:\Documents and Settings\All Users and open folders Oracle > Java. Delete jshandlr.exe. On Windows Vista and later versions, go to C:\ProgramData, go to Oracle > Java and delete jshandlr.exe. Go the directory %TEMP% and delete malicious files from randomly named folders. Open the Registry Editor and follow the path HKCU\Software\Microsoft\Windows\CurrentVersion\Run. Quick & tested solution for TheDarkEncryptor Ransomware removal.